For the past twenty years or so many software companies have oversold "quick & easy" design, just as late-night TV informercials today oversell the idea of losing weight without having to workout or change your lifestyle. Why use your brain (or work hard)? — just follow our easy template for success, they say. Now, I am not suggesting that software templates are by their nature bad things. They can be very useful. But a template without knowledge and understanding can also be a dangerous thing. In the world of software apps such as presentation tools, we often rely too much on templates and shortcuts. Instead, we should spend more time in our professional development exploring and understanding deeply the art of design in all its myriad forms before we even turn on the computer. As technology gets more advanced and more complex, much of it actually gets easier to use, yet most of the discussion is still on tips and tricks of using the features of the tool itself. What's needed — now more then ever — is better content creation, better stories, greater creativity, and the ability to think and apply a deeper knowledge of both the art and science of visual design. Type is a wonderful thing. And while I don't recommend that we all become professional typographers, it is in our interest to deepen our knowledge and understanding of the rich art of typography. Printing with letterpress or movable type in the West goes back to at least the 1400s (the Chinese were doing it even before that with woodblock printing). 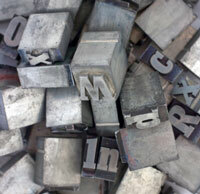 The history is deep and wide, yet most people only have a cursory understanding of typefaces or fonts. It's possible to learn much about the power of typography with a computer and books—and most importantly—a good instructor. But can we benefit in the here and now by looking to the past and even using tools of the past to get a good grounding in design and type? 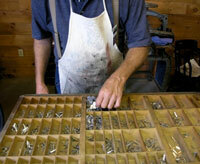 If you could study type while learning to produce good work with a letterpress, would it make a difference? The video below called Typography School features veteran graphic design/typography and letterpress instructor David Dabner from the London College of Printing. "Computers make students sloppy. It makes for sloppy thinking. Good typographers can think. If you can't think you produce a lot of nonsense. Because in thinking you can delete the non-essential." This does not mean that computers necessarily make students sloppy — computers are just tools after all — but there is no denying that a PC with all it's great power can indeed make users sloppy if they have no clue about the rules and reasons of the art. It's fine to break rules — but first you must know the rules and the traditions and the conventions. A computer is wonderful, but as Dabner says, "It won't teach you to think." Dabner here says there is nothing wrong with the computer but that it's often better to go analog and just use a pencil and paper sometimes. "They stop actually using pencil and paper and they work directly on the computer," Dabner says, "which in itself is OK, but I think the computer inhibits their ability to develop." Dabner likens applying the art of typography in today's world to playing jazz. That is: "You've got to learn the instrument first." The tools of today are fantastic. No one is suggesting we abandon them and return to the past. But we need to learn from the past traditions and the proven rules of the art as well. And learning the art with the tools of the past, with all the constraints they impose, can be an enlightening, educational experience. Today, when people say "you have to know how to use the tool" too often they mean the features of the software. Using software features is important too, but these tools are ever-changing, ephemeral ones. What is much slower to change and far more grounded is the actual art itself. 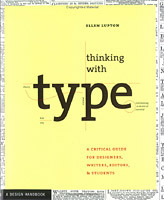 Here are a couple of good books to help you learn about type. These are not the only ones, but one of these will get you started. Here are a couple of short videos just for fun. Last week I had a quick three days in Silicon Valley. Three days and three presentations that went like this: (Wednesday) Duarte Design, (Thursday) Microsoft, (Friday) Google. I even had a little time at Apple. on Friday afternoon. The weather was great and the mood laidback and relaxed. 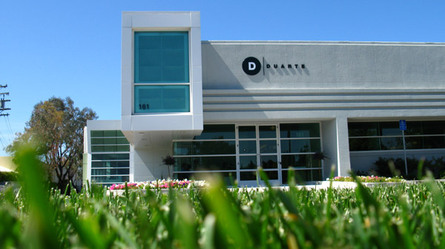 Duarte offices in Silicon Valley. Presenting in the Duarte theatre. Signing books during the party. The first night I was at Duarte Design in Mountain View. Over 100 people showed up from the valley, including about 12-15 from various Apple departments. They even had a live jazz trio in the corner. 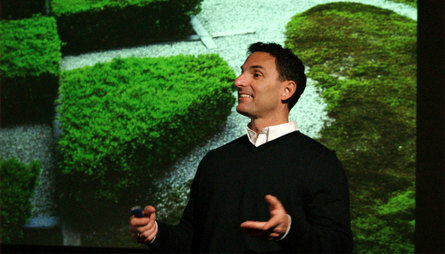 Duarte Design had a good "presentation zen" vibe going on in their offices (more pics in the Flickr slideshow below). I also had a chance to see Nancy Duarte's new book about presentations. It's not decided yet, but the release date looks to be later in the summer. You will definitely want to get her book as it is a good complement to Presentation Zen. Her book is going to be a best-seller for sure. I love it. It's not a how-to-use-slideware book at all; it's a book about design and presentation and visual storytelling. It's (obviously) very visual, educational, and inspiring. It's a beautiful book. Left: With Ric, Program Manager for Microsoft PowerPoint. 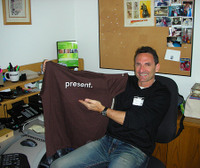 Right: In Ric's office showing off my gift from the PowerPoint team. The second day I went out to Microsoft (which is only a few minutes from Duarte) at the invitation of the PowerPoint Program Manager Ric Bretschneider to present for the PowerPoint team (checkout Ric's presentation blog for loads of podcasts on presentation). This was very informal and a lot of fun. The PowerPoint guys were mostly from the technical side. Really a nice group of people. 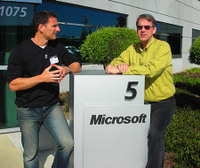 After the presentation, Ric walked me around the Microsoft campus. I presented in a conference room to about 30 PowerPoint employees, but I was blown away by the facilities at Microsoft. The main auditorium is awesome. Really a cool theatre with big monitors above the first rows so that presenters do not have to turn their backs and can instead look out into the audience and easily glance at the monitors as needed. The talk at Google went well; standing-room-only crowd that asked some good questions. I had a fun tour of the campus and a great lunch. What's Google like? Pretty much like this. The presentation should be available in the near future online. Update: The talk at Google is up now. The talk is about 55 minutes with about 10-15 mins of Q&A. It's an informal, very casual presentation style this time around. Perhaps there is something in there for you or someone you know. Google is as cool as their reputation -- a wonderful laidback campus environment. Great people. When I was in college (a billion years ago) I saw the film Gandhi about 5-6 times, perhaps more (I was a poor student but it was only $1 on campus). I was inspired by the story and the sights and sounds of India. (Partly because of the film, and my growing interest in the East in general at that time, I changed my major to philosophy so that I could study more deeply the history of the region and the philosophies of Buddhism, Hinduism, Taoism in China, etc. This is when I first encountered Zen. Zen has its origins in India, but developed in China, and then finally made its way to Japan where it took root and is really at the heart of Japanese culture.) But although I have long been fascinated with India — its dynamic culture, long history, its food, people, languages, etc.—I am rather ashamed to say I have not yet visited the country. As I said before, it looks like I should be in India in the latter half of August for some presentations. I hope it's just the start of many trips to India. And speaking of India, in this presentation that Nancy Duarte gave at the last PowerPoint Live she talks quite a bit about her recent trip to India with a group of American female executives. A life-changing experience for her she told me. I think you'll enjoy this presentation. 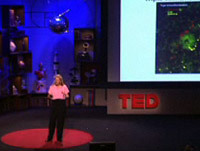 The visuals were designed to augment her live talk. The narration and visuals work online, but if you could see Nancy as well it would be even better. The lucky people who attended the conference got to experience both Nancy's charm and engaging narrative along with the visuals that augmented her talk. Below you can see part one of Nancy's talk. Slideshare is based in Mountain View (where I'll be for a few days) and they also have an office in New Delhi. 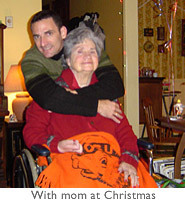 Checkout these pics below from Slideshare's CEO Rashmi Sinha. Rashmi took these during a recent Slideshare team retreat. Checkout the Slideshare blog too—you'll see a guest post there on the issue of empty space and slide design I wrote last week. 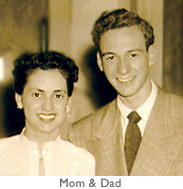 Bert Decker will have a guest post next. At the moment I'm in Hawaii for a couple of days before heading to Silicon Valley for a couple of events. On Wednesday Duarte Design is hosting a Presentation Zen book signing party (they're so friggin' awesome!). It's a private event, however, if you are in the area and would like to attend, please send me a message and I'll pass it on to Duarte (there may be room for a couple more.). I'll do a 20 minute presentation in the Duarte theatre, then it's party time (pics from the last time I was at Duarte in December). On Thursday I'll be in front of a green screen in San Francisco as the publisher and I start to film a Presentation Zen DVD to be released sometime in future. Then on Friday I'm presenting at Google during the lunch hour. This presentation will be taped and made available free online at some point, so I hope it goes well. 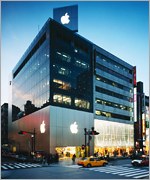 The next public presentation I am doing is April 1 at 7:00pm at the Apple Store theatre in Ginza (Tokyo). I wish I could take better advantage of social media, but I'm afraid that all I can really keep up with is the Presentation Zen blog. Nonetheless, I would love to connect somehow more with PZ readers, so look me up on Facebook. I know I am not using Facebook the way it should be, but if nothing else it is a way to meet others who at least have something in common: they are interested in "presenting different." So look me up there. Also, just for fun, if you have the PZ book, why not send a picture in with you and the book and I'll add it to the Flickr album of PZ readers around the world — be as creative and weird (or "normal") as you like. It's fun to see who the readers are from all over the world. Send me your pic and I'll add it to the album. The Webstock blog put up a short post about the NZ presentations. Slides and other forms of multimedia are not appropriate in every case. In the case of many leadership speeches, for example, we want to see the man (or woman) and be informed and inspired by their words and perhaps even moved by their presence. Images on a screen? Perhaps. But in many of the great speeches of our time the images are painted with the speaker's words. Bullet point slides? You've got to be kidding. 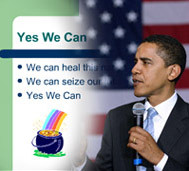 To illustrate the point of just how absurd bullets can sometimes be, imagine how much "different" (i.e., totally ineffective) it would have been if you listened to Obama's now famous "Yes We Can" speech against a backdrop of really bad PowerPoint slides. If bad slides can take some of the impact off even this kind of speech, imagine what wordy slides could do to your ability to connect with an audience. The slide deck above is from Shmula.com. For fun (if you can call this fun) start the Obama speech below and then click through the slides to follow along. If you missed the Obama speech, would reading these slides above help? This example is extreme for comedic impact, yet these slides are not so different than the millions of slides being sent around the world everyday to people who missed the presentation and said "Hey, just send me your presentation!" If the Obama slides were not horrifying enough for you, here's one more. To see how it would work if you put slides in sync with the spoken word of a great speech, checkout this one of JFK below by Benjamin Larsen. These two both remind of me of the (in)famous Gettysburg Powerpoint Presentation from years ago. Nicholas Negroponte is a famous architect, designer, and computer scientist, and certainly one of the most amazing creative thinkers of our time. You may know him as the founder of the MIT Media Lab and the $100 laptop computer guy (he's the founder of The One Laptop per Child association). He was also the original investor in Wired. Negroponte is pretty good at imagining the future it seems as well. 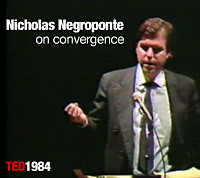 This week TED put up 23 minutes of a much longer talk that Negroponte did for the TED Conference back in 1984. (This, you may remember, was the year that Macintosh was born.) Years before the term "convergence" was being tossed around, Negroponte was talking about using technology in ways that today we take for granted. In this talk he makes five predictions about the future. See how many turned out so far. Negroponte is a smart, articulate, engaging speaker and I really enjoyed this edited presentation.This was before the days of PowerPoint and bullet points, so when Negroponte used visuals on the large screen behind him they were either large photographs or videos. Today we would run these stills and video right off the laptop seamlessly in slideware, but for a guy changing his own laser disks (remember those? ), he was quite smooth. Projectors were not what they are today so the room is dark, but as long as the lights are on the presenter it works well. 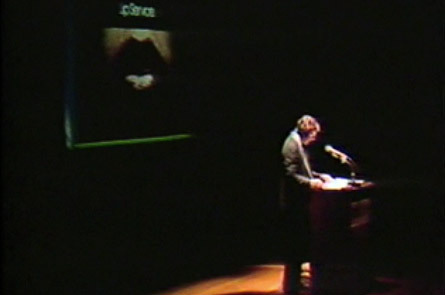 In fact darkness, save for the large screen and the lights on the speaker, give the presentation a feeling of theatre. 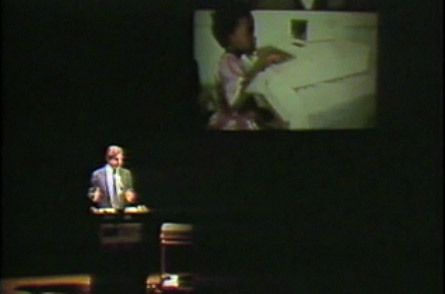 Stills from the 1984 talk. Presenting well with simple multimedia and no bullet points years before PowerPoint changed everything. My favorite part of this presentation is his comments on education. Here's my takeaway. "Good education has got to be good entertainment." By "entertainment" I think what Negroponte means is "engagement" or "meaning" or "personal involvement" and so on. Education is knowledge and information, but the hunger, drive, and the curiosity in the pursuit of understanding and meaning is emotional, it's human. Entertainment has received a bad rap in popular culture. You know, if it's "entertainment" it can't be good for you. If it is "entertainment" learning must not be going on. Many presentation situations and education in general have a lot in common; there is nothing wrong with entertaining. The thing about entertainment is that it is other-focused, the way it should be. It's not about us, it's about them. Different audiences are "entertained" in different ways—it's up to us to figure out what the most effective methods are for stimulating, affecting, and informing. Entertainment is not necessarily a distraction, diversion, or escape. Entertainment in the best sense is about engagement, connection, and meaning as well. Conference keynote presentations in general can be rather mediocre, forgettable events. So why not take a chance and do something different? At Mix 08 it looks like that's what happened. 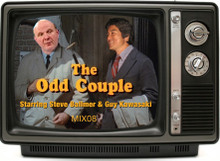 Guy Kawasaki (who wrote the foreword for the Presentation Zen book) links to a very interesting video from Mix 08 featuring his interview with Microsoft CEO Steve Ballmer which served as Steve Ballmer's keynote. Choosing Guy to do this was very surprising and a bit risky, but I thought it was great. Guy brought an edge to it and Steve was a very good sport. They make a very odd couple indeed, but somehow it worked. Not all people will appreciate Guy's humor or Steve's, um... enthusiasm, I am sure. 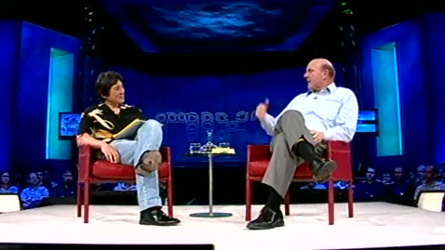 But I never enjoyed a keynote by Steve Ballmer more than this one. It sure was not boring. I know many people think Steve Ballmer can be over the top on stage (to say the least), but I thought this keynote was entertaining, authentic, and even informative. And not one PowerPoint slide was used—imagine that. Go here to download the video. (I did not have to install Silverlight, the video opened up fine and I saved it as a QuickTime movie (I am assuming because I have Flip4Mac installed?). During the Q&A session, one Web developer asked Steve if he'd show some love for Web developers (like he did for developers in general years ago). Click here to see what happened. 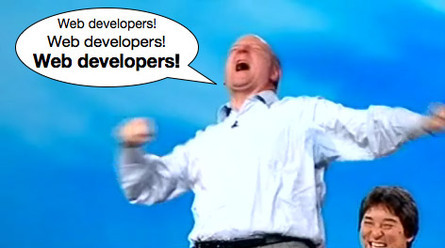 Steve Ballmer gets playful on stage with Guy's MacBook Air. (No, he did not really smash it). A lot of jabs, and joking around during the hour. At one point Steve even barked like a dog (you just have to watch the video). It was not all jabs and jokes. Steve Ballmer actually had some interesting things to say—mercifully, without bullet points. Overall I thought this was a really nice—and different—keynote. I much prefer Steve Ballmer doing something like this than his standard one-way PowerPoint presentation that I have criticized in the past. Here are a few links just in case you didn't get some of the references (e.g., "...don't go 'monkey' on me," etc.). • Web developers! Web developers! Web developers! • Original "Developers! Developers! Developers!" cheer. If you have a spare 12 minutes perhaps you will find something useful in this short telephone interview I did with London's Duncan Gotobed. 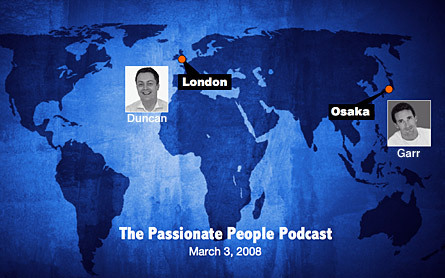 Duncan is the founder of Top Briefings, which he started in 2006 as a way of passing on practical hints and tips to people who are short on time. Go to the Top Briefings Passionate People website to see an outline of the questions discussed. Also check out the other interviews there too. Other podcasts I did recently on issues related to PZ.